Welcome to the Couplers of The LR &B Model Railroad. 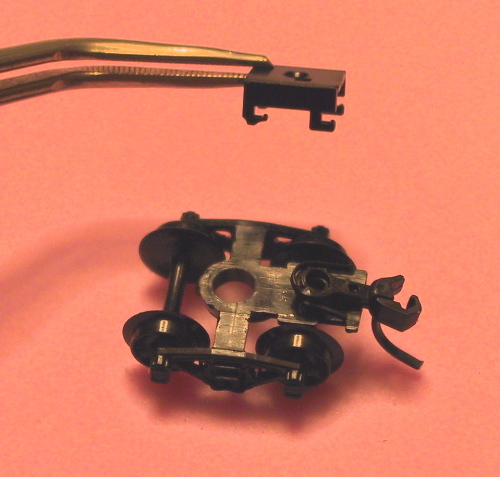 Notice how the Accumate coupler extends much farther from its coupler pocket than the M-T coupler does. Of course, the M-T coupler has its own drawback. It suffers from an annoying "slinky" effect, when M-T equiped cars experience the back-and-forth bouncing of cars when a train is starting up, except this occurs while the train is already running at speed. 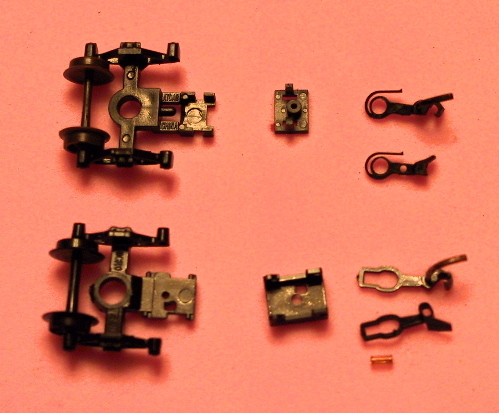 We will now reassemble the coupler pocket on the Micro-Trains truck. For clarity, my fat fingers are nowhere to be seen, but in real life, they would be holding the Accumate coupler in place on the M-T truck. 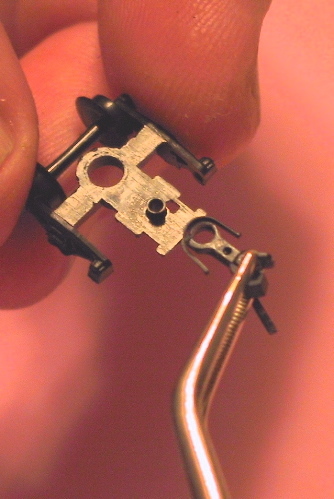 Also, more fat fingers (instead of the tweezers shown) would be positioning the Micro-trains upper coupler pocket top so as to lock it in place on the floor of the coupler pocket. 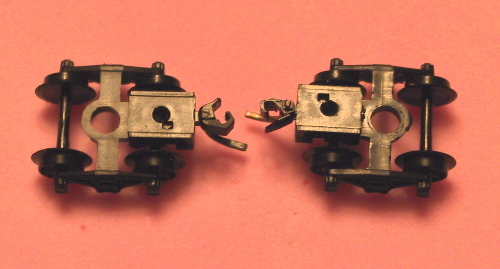 Once you CAREFULLY lock the M-T coupler pocket in place (taking care to keep the Accumate coupler COMPLETELY within the coupler box), the finished hybrid product will look like the M-T truck on the left (below). For contrast, an original M-T truck is shown on the right. Notice that the dreaded Accumate extension is now gone, and because of the nature of the Accumate coupler shank, the slinky effect cannot occur anymore.